Joint replacement operations have an excellent success rate with patient who were previously crippled by painful, stiff, arthritic joints able to walk again. During the operation the surgeon cuts and prepares the bone then places the new prosthesis as accurately as possible in position using a series of jigs, saws and other instruments. Our aim is always to be as accurate as possible but most studies show some variability in how well we achieve this. Our attempts at accuracy are now helped by the availability of a surgical robot that helps with the planning and execution of the operation. The most commonly used Robot in Australia is the MAKO* robot. This has been used for over 10 years in the USA but has been available in Australia for Partial knee replacements for 2 years, Total hip replacement for 1 year and is now available for total knee replacement as well. Preoperatively the patient will have a CT scan which allows the surgeon the ability to plan the position of the component in all planes. During the operation the CT scan is matched to the patients’ anatomy, the bone is then prepared and the implants are positioned as per the plan. Mr van Bavel performed the first Robotic Total Knee replacement in Victoria, as well as performing the first robotic total hip replacement and partial knee replacement at the Epworth hospital. The setup involves 3 separate pieces of equipment. The robot and end effector ( tools). What is Robotic partial knee replacement. 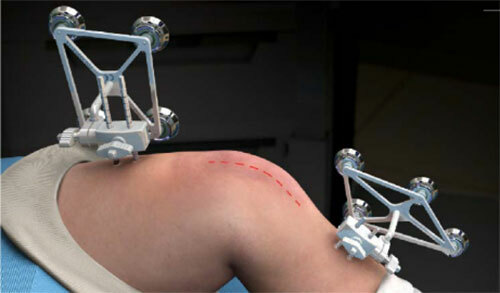 It is the replacement of a part of the knee with the assistance of a robot. The Inner (medial), outer (lateral), front (patellofemoral) parts can all be replaced individually. Rarely a surgeon may want to replace 2 of the 3 parts at the same time ( Bicompartmental replacement). How long has robotics been used to partial knee replacement. 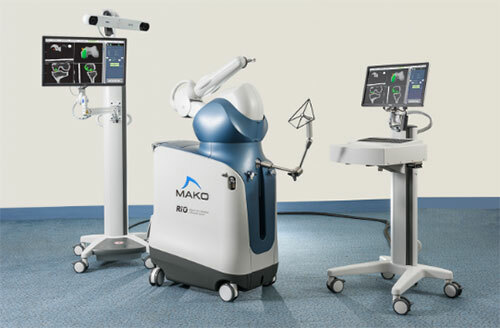 The first Mako robotic partial knee replacement was performed in June 2006. Since then more than 50,000 procedures have been performed around the world. In Australia over 1000 procedures have been performed since its introduction in 2015. Mr van Bavel has been performing robotic Partial Knee replacements since 2016. In 2017 the Australian Orthopaedic Associations National Joint Replacement Registry showed a 1 year revision rate of the MAKO partial knee replacement to be 0.8% which is the lowest of all listed prosthesis. The average for all partial knee prosthesis was 2.2%.. This is in keeping with previously published data for the Mako from the USA showing a 1.0% 2 year revision rate. There are is no long term data on survivorship of this procedure. How is the operation planned. 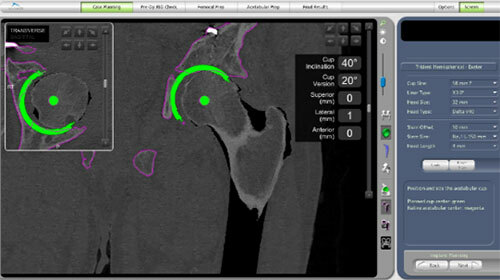 Prior to the operation the patient has a CT scan of the knee which allows the surgeon to plan the size and position of the implants that will be used during the operation. 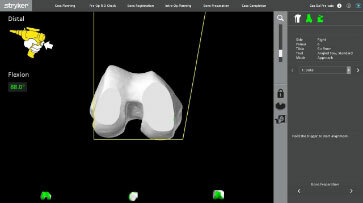 This allows matching of the implant to the patients’ personal anatomy. How is the operation performed. Small metal pins are attached to the leg and “trackers” or “arrays” will then tell the sensor where the leg is and when it is moved. The patients’ anatomy is then checked and a series of points are registered to ensure the anatomy is matched to the CT scan. 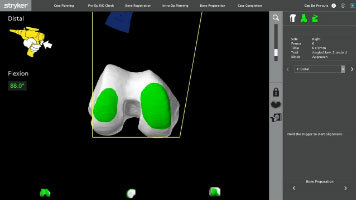 The knee is then put through a series of movements and the tension in the ligaments is measured and the movement of the knee is observed and the contact points between the components recorded. 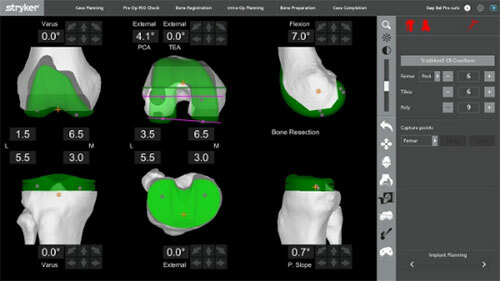 This produces a graph of the knee and a 3D model of how the knee will work after the replacement. 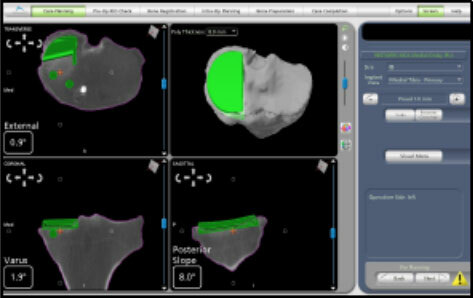 The surgeon can then adjust the planned component position to change any aspect of the plan they want to improve. 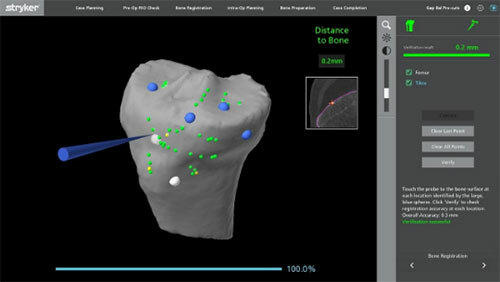 Once the plan is set the bone model is shown with an area highlighted in green which is the bone to be removed. 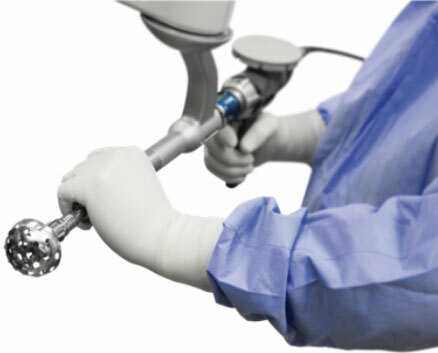 The bur is then used by the surgeon to remove the bone but the robotic arm doesn’t allow the bur to move outside of the plan making this a highly accurate procedure. While the main cut used may be slightly smaller than a standard operation there is no significant difference in wound size. The prosthesis used is called the “Restoris” partial knee replacement and was designed specifically for use with the Mako Robot. There have been studies which show improved accuracy using robotic for partial knee replacement. We hope that improved accuracy will lead to better outcomes for patients. It is an operation where the surgeon uses a robot during a hip replacement operation . This is the same as a normal hip replacement but a robot is used to try and get the components in an accurate position every time. We think that getting the hip replacement right is important for better outcomes for patients. The first robotic arm assisted hip replacement was performed in October 2010. In Australia the first Mako Hip replacement was performed in 2016. Mr van Bavel has been performing robotic hip replacements since February 2017. Prior to the operation the patient will have a CT scan of the hip. From this any difference in leg length between the 2 sides is measured and if necessary a correction can be made in the surgical plan. The size and position of the components is then planned to the patients’ own anatomy to try and get the best match for each patient. For the most part this is exactly the same as a standard hip replacement except for a few small differences. Metal pins are inserted into the iliac crest (pelvic bone) with an array attached which allows the robot to see where the pelvis is positioned at any time. 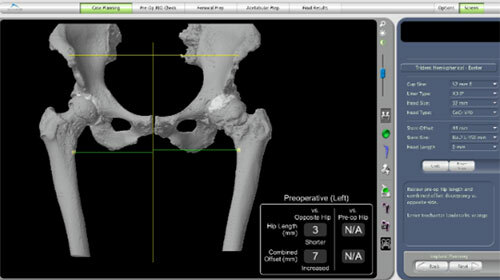 Early in the surgery a series of anatomic landmarks around the hip are registered with the robot that allows it to recognize the anatomy and match it to the CT scan. When preparing the bone for the acetabulum (socket) and inserting the prosthesis; instead of doing this freehand, the robot holds the instruments in the position that was planned to ensure the plan is followed. When preparing the femur the feedback from the robot informs the surgeon if what they are doing conforms to the original plan. The prosthesis used for this are standard hip replacement prosthesis which have been around for many years. Mr van Bvael uses the Exeter/Trident hip replacement for this. This is the most commonly used hip replacement in Australia. It has excellent long term results. What is the revision (redo) rate. There is no data specifically looking at the redo rate for robotic hip replacement in Australia. In The Australian Orthopaedic Association 2017 Annual Joint Replacement Registry the Exeter Trident hip replacement has a revision rate of 4.1% at 10 years and 5.7% at 15 years. The average revision rate for hip replacements in Australia is 6.6% at 10 years and 9.8% at 15 years. Is this a “less invasive” procedure. No. The same approach (cut) is used as a standard procedure. The robot can be used for any approach ( Posterior, anterior or lateral). Is it more accurate ? There are some early research papers that show increased accuracy of component positioning with robotics compared to manual techniques. We hope this will lead to a lower dislocation rate and better patient outcomes. Domb BG, et al,. The Learning Curve Associated with Robotic-Assisted Total Hip Arthroplasty 14th Annual CAOS Meeting, June 18-21, 2014, Milan, IT. 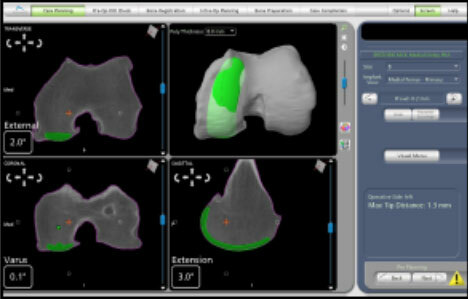 Accuracy of Cup Positioning and Achieving Desired Hip Length and Offset Following Robotic THA. Jerabek SA; Carroll KM; Maratt JD; Mayman DJ; Padgett DE; 14th Annual CAOS Meeting, June 18-21, 2014, Milan, Italy. 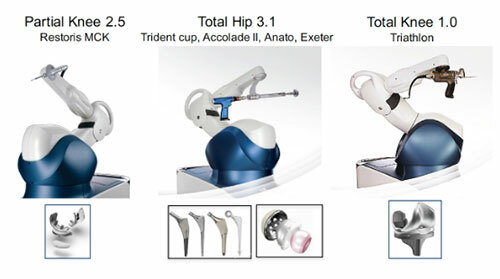 Bukowski, B.; Abiola, R; Illgen R. Outcomes after primary total hip arthroplasty: Manual compared with robotic assisted techniques. ; 44th Annual Advances in Arthroplasty; Cambridge, MA. October 7-10 2014. Suarez-Ahedo, C; Gui, C; Martin, T; Stake, C; Chandrasekaran, S; Christopher, J; Domb, B. Preservation of Acetabular Bone Stock in Total Hip Arthroplasty Using Conventional vs. Robotic Techniques: A Matched-Pair Controlled Study. CAOS International 15th Annual Conference; June 17-20, 2015, Vancouver, Canada. The first robotic arm assisted Total Knee replacement was performed in June 2016. Mr van Bavel performed the first Robotic knee replacement in Victoria in November 2017. Before the operation the patient will have a CT scan of the knee. From this the size and positioning of the prosthesis is planned to fit the patients anatomy. 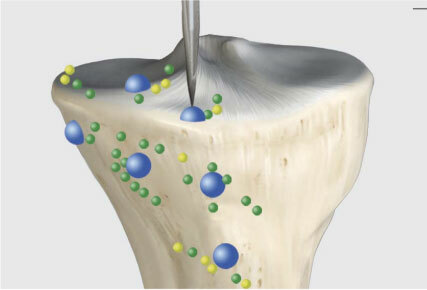 The operation is very similar to a standard knee operation and uses the same cut at the front of the knee. 2 small pins are attached to bone on either side of the knee and this helps the robot during the operation. Early in the operation multiple landmarks are checked and rechecked to allow matching of the patients anatomy to their scans. 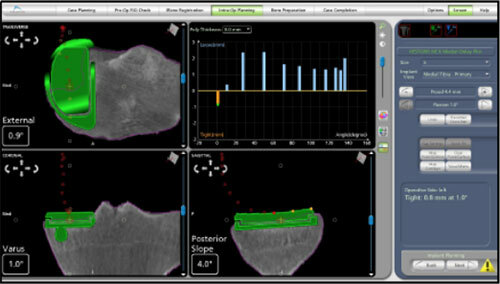 After assessing the patient’s ligament tension, gap analysis, and limb alignment, surgeon controlled intra-operative adjustments can be made to the pre-operative plan in both flexion and extension before bone preparation. Ie The plan is then checked and adjusted with the surgeon aiming to give the best knee replacement - ie one that moves well , without pain and feels as close to normal as possible.. The Triathlon Total Knee system from Stryker. This is the most commonly used knee replacement in Australia. There is no specific data yet on revision rate for robotic knee replacement. The procedure uses the Triathlon knee replacement and there is abundant long term data on its success. 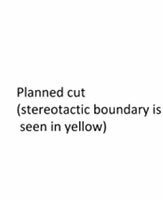 No a very similar size cut is used to a standard procedure. There have been a couple of research papers looking at this which show increased accuracy and precision, and protection of the soft tissues around the knee.